Travel with us from Yachats to Coos Bay along 101, and take side trips up Rte.38(The Umpqua)and Rte. 126 (The Siuslaw River) to where they both meet Interstate 5. 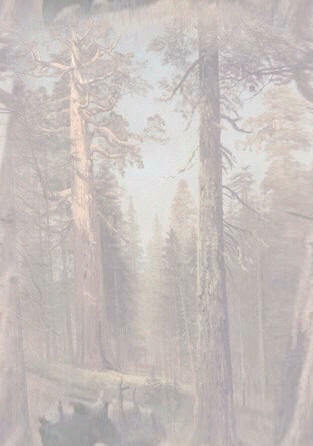 The Umpqua goes to Roseburg and the siuslaw winds its way to cottage grove. We are still working on the Siuslaw to Cottage Grove page and we will add interesting pics along all the routes as we adventure around the back yard through the summer, so check back often to keep up on our adventures. We appreciate all those entries in the guest book too. We lost the original guest book, please fill this new one up for us!! 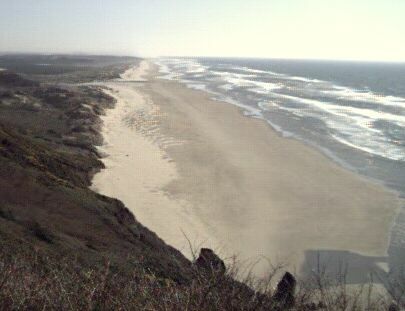 This view is off Highway 101 which runs along the Oregon coast from California to Washington. 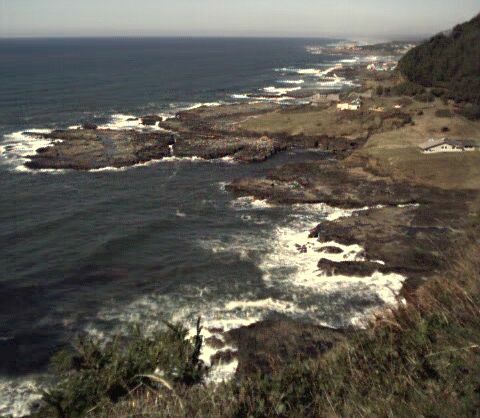 This is looking north to the town of Yachats, the Yaquina river empty's into the ocean there! The ocean is raging down below, it looks calm off shore and is fairly calm, but the impending wave action crashes violently along the shoreline making quite a roar! The ocean saltwater rushing thru the cracks in the rocks is good fishing I am told! The rock cod like to hide in these fissures and catch unsuspecting prey that gets washed by them in the furious wave action. Anything that moves is fair game to them, I am told they prefer sand shrimp, and hope to see for myself if it's true! Rock cod are supposed to be excellent table fare, and average 5 to 10 lbs. The next pic shows more rock cracks in the ocean walls, that could be hiding the delicious rock cod! This pic is looking right straight west over the cliff that Rte. 101 winds around to traverse the hill I'm standing on. 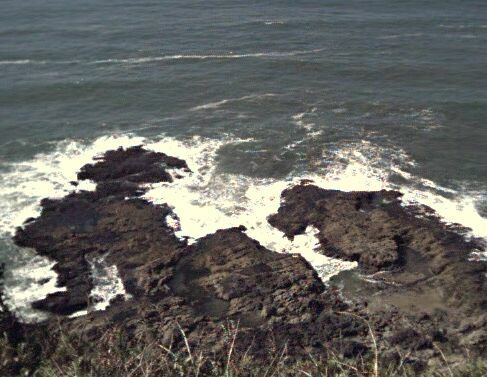 The white water below is quite loud and turbulent, more good places for the rock cod to hide and feed, we never see anyone fishing for them, I hope to have a pic of one soon. This pic is a little farther south, looking to the southwest. See the "little" whitecap way out there, that one wave will wash ten feet or so farther up the bank than the rest of them! Its a gorgeous view on one of Oregon's rare sunny days! The picture is taken looking off of Bray's point! All of these pics are along Rte. 101. This is Cook's chasm, it is a very deep fissure in the rock wall that is narrow and steep. It has been carved out by a small stream that drains the runoff water from the mountains to the east! The roadway has a bridge over it, it looks like a terrific place to find some rock cod hanging around looking for a bite to eat! 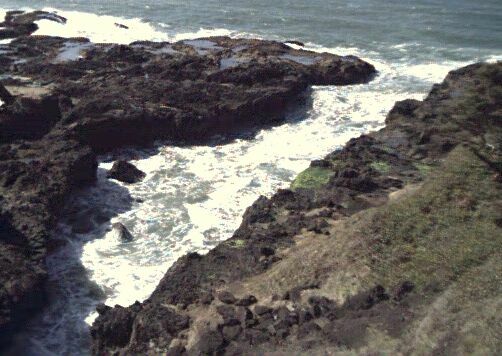 This chasm is a little further south from Yachats toward Florence, and has a parking area for day use. Unfortunately all the day use areas charge a fee of 5 dollars, so its best to get a season pass if you plan to spend much time here. We stopped at a pullout to snap a pic of the light house. I counted six seconds between light flashes, and was able to catch the light in the picture. That white dot in the dark top is the flash of the lighthouse light as it rotates to alert mariners to there position at sea. Unfortunately you can't get very close to it, without paying a fee. They claim it's the most photographed lighthouse in the world. The ocean waves are tremendous, the camera really doesn't do them justice. Beach? What Beach? LOL This is looking south toward the Florence north jetty, you can barely make it out way down there. Its about 6 miles as the crow flies. No problem finding sand here :-). Looking to the left you can just see the edge of Lilly lake nestled in a hollow surrounded to the west by a pine forest and the Ocean. To the east by sawgrass and highway 101! 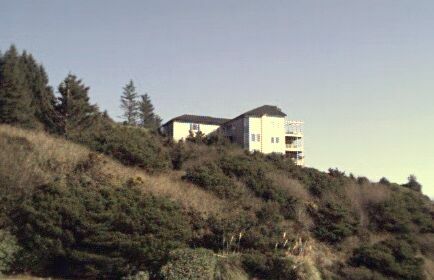 These type homes abound along route 101, they are a tad too windy for my taste, but they have a spectacular Ocean view, and are surrounded to the east by the steep pine forested hills of the Siuslaw National forest! Elk crossings (as opposed to deer crossings) are plentiful! This is the North jetty extending out in front of me, on my left is the Siuslaw river, across the way is the tip of the south jetty! On my right is the Pacific ocean, it is raging wildly today. The waves are crashing over the jetty at times and I am risking life and limb to get this shot! Places in the world like this really have a way of making you feel "small" and insignificant. It is probably ten feet down to the water and out at the end I can see the waves are higher than my head breaking over the end of the jetty! The dark spot in the river is a black cormorant, he ate a couple of fish while the river swept him along toward the ocean, the current carried him faster than I could walk along beside him. To my right is the ocean. It is quite violent today, you can't speak and be heard at this point. The tide is going out, allowing me to get out here and take these pics. We are looking north up the "beach" toward the spot where I took the earlier picture with Lilly lake in it. It's too hazy to see that far(6 miles)! This is looking right down the jetty!! Ocean on the right and river on the left It captures the violence of the wave action a little better! 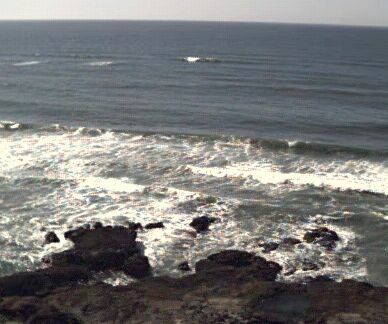 The siuslaw on the left is a raging torrent in itself as the fresh water rushes toward the ocean in the outgoing tide. That rush meets the 10 to 15 foot waves coming straight in at us. The result is whitewater with a twist! 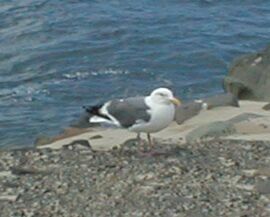 On my way back off the jetty I got real close to this ocean pidgeon.